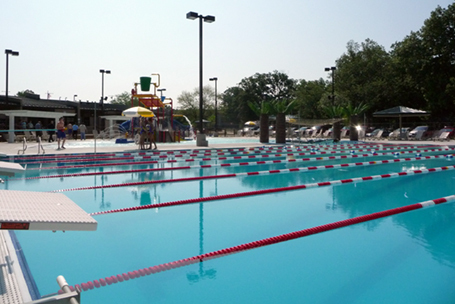 Located in Bryan Memorial Park near the site of the recently demolished 75-year-old pool, the new $3.4 million Salem Family Aquatic Center includes a 9,000 sq. ft. main pool, a 720 sq. ft. toddler pool, large bathhouse and concessions area, mechanical building, and improved access drives, utilities, landscaping and parking lot. Through the efforts of the Counsilman-Hunsaker-led team, the city was also awarded a $400,000 State of Illinois Department of Natural Resources Open Space Lands Acquisition and Development Program (OSLAD) grant. By combining aquatic features that provide a combination of competitive swimming, entertainment value and instructional opportunities, the city of Salem is able to stay at the forefront of the industry, giving guests a reason to visit time and time again. Counsilman-Hunsaker provided a site-specific systems and operations training following the nationally recognized guidelines of the National Swimming Pool Foundation (NSPF) Certified Pool/Spa Operators course. This course emphasized and concentrated on systems and procedures to be used at the Salem Family Aquatic Center.